As Sylvester the Cat might put it, "Our cup runneth over!" Not that it ever really began. You see, hopes of a lucrative run in the FA Cup, and the remote possibility of appearing in a live televised game that's covered badly by ITV, were brought to an end by a piece of refereeing so diabolically poor that the Cammell Laird bench immediately came over to their Mossley counterparts to offer their sympathies. Of course they could have asked their player to miss the penalty that was the result of that decision but hey, camaraderie in football doesn't extend that far. The moment of contention came in the 94th minute when Leon Henry nipped in front of a lumbering Lairds player to knock the ball out for a throw-in. As the ball arced over the touchline both players made contact with each other and the one in a blue home shirt stumbled earthwards - incredibly slowly. It wasn't one, it didn't look like one and nobody appealed for one yet the referee, after five seconds of contemplation, decided to award Cammell Laird a penalty for the incident. To say that you could have heard a pin drop when people realised he was pointing to the penalty spot would be understating things a great deal. The ludicrousness of the situation was then compounded further when Henry was sent off and the referee started waving yellow cards around like a small child does a balloon on a stick; the Mossley's players rather understandably irate at a decision born out of sheer incompetence. The fact the linesman who was far closer to the incident never signalled a foul, or that the Laird players and supporters never appealed for a penalty should have been an enormous clue that it wasn't one. I know the game has a problem with officials departing it but if man in the middle in this game (I'm not going to give him the satisfaction of learning who he is) honestly believed that what happened was a penalty then it can afford to lose one more. The fact that another team could soon be on the receiving end of one of his brainstorms one day is a frightening thought. If there's a crumb of comfort to be taken though from that late debacle it's that we were at least spared the horrifying prospect of watching the two sides play out another ninety minutes in the replay. It was a poor game between two (and I have to be blunt here) pretty poor sides. The first half I shall largely ignore because it was really pretty frickin' awful. The home side should have taken the lead as it neared its end but for the most part it was devoid of anything notable other than poor football; Mossley once again confined to hoping that a set piece would bear fruit. What followed after the break was marginally better and no doubt helped by Lairds taking the lead ten minutes in. Not for the first time in this still young season Mossley's defence was opened up by a series of quick, short passes which allowed Corrigan to cut into the box unchallenged and score. There was then twenty minutes spent watching somebody driving around in a circle in the neighbouring bus depot before another moment of note happened on the pitch. A through ball had sent Curtis Noble galloping towards goal but as approached the area he was scythed down from behind - the red card that followed bringing no complaints at all from the home team. The free-kick resulting from the challenge was fired narrowly wide by Sam Walker and that appeared to be it for the game, until 'that' moment in the fourth minute of time added on when Lairds won the game. There is a flip side to that late penalty decision though. While it was grossly unfair on Mossley, it also helps take the spotlight off what was another very below average performance by the Lilywhites. The season may be still in its infancy but there is some cause for concern. I'd like to be able to go into detail about those concerns but I can't be bothered really, especially as I've already touched on them twice this season. And to be truthful there shouldn't really be a report of any kind here. I had no intention whatsoever of going to this game. It was only after a lengthy discussion that I relented and made the trip (partially in the hope that it in some way would rekindle my spark for the game) and did so with the promise to myself that if anything was going to appear on the blog it would be video only. However... it's four in the morning, I've got insomnia and this is the result. It's not a great report I know but having only had around five hours sleep in the last 72 hours, it's about the best it's going to get without hallucinations caused by sleep deprivation creeping in. Then again, the introduction of a talking animal or two would improve the football no end at the moment. ...The Trophy debacle and rot. On the eve of our trip to Cammell Laird where we'll begin this seasons FA Cup trail (or both start and end it), I thought it might be an idea to remind everyone of our last trip to Kirklands, almost three years ago. Again it was an FA competition that took us there - the FA Trophy - and what a thoroughly enjoyable afternoon it was. The word enjoyable used in it's "not very at all" sense. Back in November 2006 Laird where in the midst of their rapid rise from the lower echelons of the North West Counties League to the Northern Premier. The Lilywhites on the other hand were in the middle of a campaign that was heading the opposite direction. As if to prove that spending money (and lots of it) doesn't necessarily buy you success, Mossley had assembled an expensive squad of under performing players, a wedge the size of Texas was slipping between the board and the supporters and the management (who shall no longer be named on here) were about as popular as a dead rat in a tampon factory*. Still though, we went with optimism. A good win against a good side could finally kick start the season. And with an exciting new signing in the shape of Fraser Robinson in the squad, there was every chance that could happen. We turned up large in number and hoped. And hope sprung infernal. *A joke shamelessly stolen from the film Top Secret, which if you haven't seen is a situation that should be rectified immediately. Being the hardened football supporters I know the few readers of this blog are, we're all fully aware that a goal less draw doesn't automatically mean that a match was dull. Far from it. If you're expecting me now though to follow that opening sentence by doing a switch - to go on and describe just how boring this match was - then you're going to be sorely disappointed. In fact everybody is probably going to be disappointed with what follows next so consider yourselves lucky for being given a head start. So apart from the nil-nil score line the only other thing of note I can bring you about the match is this report from the Blackpool Gazette. One which seems to suggest that once again we never really got the gun from its holster, let alone had the chance to fire off some fire blanks. Still, a point is as good as none and it brings to timely end that early season losing streak as we head off to Cammell Laird in the FA Cup. If when the fixtures were announced in July you were to ask any level headed Mossley fan (yes, there are some) if they'd be happy with three points from the first three games - games against teams who've been prickly thorns in the Lilywhites' side over the past few years - they'd probably have said yes. Therefore the fact that those three games yielded just those three points shouldn't really set the alarm bells ringing. What does though is that after claiming a first ever win at Garforth on the opening day of the campaign, Mossley barely let out a whimper in losing to, first, Colwyn Bay and then Lancaster City. While the defeat to the Welsh side was heavier, the reversal against Lancaster was possibly worse as not only were they nowhere near as impressive a side as Colwyn Bay (not that they needed to be given Mossley's performance or lack of it) but lessons that ought to have been learnt after the midweek game weren't. It was the visitors who wielded most, if not all, of the early pressure and there reward was quick in coming. A low cross field pass in the 14th minutes split Mossley wide open and after cutting in from the wing Mike Rushton made no mistake when angling his shot past keeper Peter Collinge. Some good, if at times desperate, defending and a couple of slices of luck prevented the lead from doubling on more than occasion; the Lilywhites penalty area playing host to a succession of scrambles in which the ball bounced around as if it were a pinball. Unfortunately they were problems Mossley never looked like causing at the opposite end of the pitch, as an isolated front line again struggled to get close to winning any of the succession of high balls being pumped towards them. It was only at set-pieces where they were getting a modicum of joy: an in swinging corner from Curtis Noble was headed off the line and it was from another of his dead ball deliveries that Matty Kay scissor kicked a chance narrowly over the cross bar. That the half-time whistle arrived with Mossley only the one goal in arrears was something of a relief. The hope that the break would give the home side a chance to regroup though was dashed within a minute of the match restarting. Straight from the kick-off Mossley surrendered possession in the cheapest manner possible and moments later a right wing cross was allowed to roll across the face of the net to where Paul Jarvis was arriving unmarked at the back post. A goal virtually identical to the one Mossley conceded just after the interval against Bay. Two should have been three not long after. Again it was another cross that was able to travel untroubled along the six yard box but this time the City forward somehow conspired to direct the ball onto the post rather than into the open net. It wasn't until the 78th minute that City's keeper Martin Fearon was finally called on to extend himself. Picking up the ball at the back of the box following a slightly over hit corner, substitute Nathan McDonald unleashed a fierce volley that Fearon did well to deflect away to safety. Rather than the start of a spirited fight back however it proved to be Mossley's last act in anger at attempting to rescue the game. With Lancaster content to sit on their lead and the Lilywhites misfiring as an attacking threat, the match drifted slowly towards the conclusion that looked an inevitability from almost the moment the second period started. That meant ten minutes of watching the grass slowly grow which, if you paid full price admission, equated to around 78p to witness such a privilege. I could if I wanted make this report twice as long with my other thoughts on the game. But in doing so I’d only be repeating what I wrote in the latter sections of my review of the last match, except maybe with a touch more exasperation. There was the same lack of ideas. The same hopes pinned on a long ball game that didn’t work. Similarities in the way the defence and midfield switched off at inopportune moments. All of which combined lead to something of a pretty miserable afternoon. As I kind of intimated way back at the beginning, as a supporter you don’t mind your team losing - it is part and parcel of the game after all - its how you lose that’s important. If they’ve gone down battling you can have no complaints. If however it’s one where the white flag was waved pretty early on, you have right to the leave the ground feeling slightly miffed and there were some slightly miffed people heading towards the exits on Saturday. Before I bring this report to a mercifully swift conclusion though I’m going to point one thing out. Over the course of the ninety minutes against Lancaster we managed not one single shot on target during open play, with only one off target in the same period. And if that’s not sign that something may not be quite right, I don’t know what is. Of course it’s still early days and no season has ever been decided on the events of its first week. But with important cup games on the horizon it’s to be hoped that Mossley quickly find the form that’s so far eluded them. And frankly it’s a hope that wouldn’t go amiss for these match reports either! Fingers crossed one of them contains something mildly amusing very soon. I'm beginning to think that I'm a victim of an elaborate conspiracy. Last year I missed the opening game of the 2008/09 season; a two – nil win at Clitheroe that was lauded by all who went as a superb performance. Buoyed by these comments I attended the next match hoping to see what all he fuss was about. What I got to see though was Radcliffe Borough run rings around the home side as Mossley produced a spectacularly woeful performance. One in which our attacks consisted solely whacking the ball as far up the pitch as possible and one in which the defence was there in name only and not deed. Fast forward twelve months and the reports from Mossley's opening day win at Garforth are unanimous in their praise of the display the Lilywhites put in to take the three points. A few days later it's my first game of the season and once again the evidence before my eyes doesn't match what I've been told. Instead of a nice passing game and some steely defending, all I see is the ball hoofed aimlessly down field once more and a back line that seemed to fade in and out of this plane of existence at startlingly regular intervals. So come on, own up! We haven't played well on the either of the last two opening days have we? It's all just a ruse to make me feel bad about missing the opening two matches isn't it? Like I say, I sense a conspiracy. That all changed though when the minute hand on the clock passed thirty, or rather 8:15pm, and Mossley took the lead. A cross Sam Walker floated into the box looked to be an easy catch for Bay keeper Chris Sanna but one fumble and a collision with three other players later, the loose ball landed at the feet of Mattie Kay and the Lilywhites midfielder calmly poked the ball into the empty net. Matty Kay declares himself happy at scoring the opening goal. Rather than putting the Lilywhites on the road to a much welcome victory against a side who've become one of their bogey teams, the goal merely turned out to be the equivalent of poking a sleeping bear with a pointy stick while covered head to toe in honey. And as a consequence the lead lasted all of two minutes. Foreshadowing what was to come after the break, Eddie Jebb was allowed to cut in from the wing and move towards goal without so much as feeling the breath of a Mossley player bearing down on him. With time and space to pick his shot past Peter Collinge he did just that and it was all-square once more. The home sides appetite for destruction was in evidence barely a minute into the second period. A bout of 'after you Claude' between the goalkeeper and defence allowed a Bay forward to nip in and launch the loose ball towards an open net. Or rather to a point at least two meters to the right of it. What followed not long after could be claimed by the optimists amongst the Seel Park faithful to have been the turning point in the game. Bay right back Steve Aspinall completely misjudged the bounce of one of Mossley's 'attack launchers', allowing Danny Egan to get goal side of him as he bore down on the box. One hand on the shoulder and one dragging motion later, Egan was sent tumbling to the ground just outside the penalty area with only the keeper to beat. It wasn't a penalty but the denying of an obvious goal scoring opportunity should have meant that Aspinall received a red card but no, in his infinite 'wisdom' the referee deemed only a yellow was necessary. There is a possibility the game may have swung in Mossley's favour had Bay been reduced in numbers but even as a Lilywhites fan I can't help but feel that we'd have still gone on to lose if we had the man advantage – we really weren't that good. The resulting free-kick was fired low into Sanna's arms and little did any of us know that the effort was going to be our beloved 'Whites last shot in anger on the night. On the next occasion the ball moved to the opposite end of the pitch the Welshmen took the lead. Again it had a generous helping of largesse from the Mossley players as the failure to twice clear their lines following a corner, combined with some statue like defending, allowed six and a half foot Daniel Jarrett to ghost in unseen at the far post and fire the ball home. Three minutes later and it was game over as another ball into the box was met with little resistance and Anthony Sheehan added his name to the goal sheet. At this point the frustration began to show in the Mossley players and some hefty tackles were eventually eclipsed by one from Danny Dignan which started a 20 man free for all. The incident should have seen both him and the Bay defender who retaliated to the challenge by lamping him one in the face sent to the changing rooms. Once again though the referee showed an extraordinary amount of leniency by only showing yellow cards to the pair of them. With the final whistle nearing three became four as another defensive rick allowed Tom McGill to get his name on the score sheet, and it took a good save from Collinge in a one-on-one to stop a fifth being added in stoppage time. It's a strange thing to say but a 4 - 1 subduing at home turned out to be a decent result because the margin of defeat could, and possibly should, have been so much greater. Every time the ball got near our defensive third of the pitch it looked like there was a chance it could end up in our net. But there's no shame in losing to a good side and Colwyn Bay are a good side - that's a fact that's hard to deny. What you can't tell is just how good they are because with the way we played we'd make any side look good. Even Stalybridge Celtic. Still, it's only the second game of the season and you can't really be too critical at this stage of proceedings. That said however what's not a little bit galling is that the pitch at Seel Park is the best it has been for years yet we made no real attempt to play the ball along the grass. Instead it was the long ball. One after another, ad nauseum. Now I can understand that we may have been trying to utilise the pace of the two Danny's by dropping balls behind the Bay back line. However with two giants (and relatively pacey ones at that) making up the centre of visitors defence they didn't get so much as a sniff, yet there was no real variation from the formula when it was becoming obvious it was a plan doomed to failure. It was only when we were 3-1 down and with time running out that we finally saw a bit of a difference. Dignan and Egan moved wide to allow Nathan McDonald to play through the centre and that extra bit of width finally caused the visitors defence to sit up and take notice a bit more. Too little too late though. After the poor showing at home to Radcliffe last year, Mossley produced a fine display of good attacking football the following weekend to put three unanswered goals past Warrington. If history is going to repeat itself with the first two games of the season, let's hope the deja vu continues with the third against Lancaster on Saturday. Why, some of you may be asking yourselves, is there no report from the Garforth game on here? The answer is I didn't go - it's a simple as that. No inclination to go either. Instead I had an afternoon catching up on stuff I've been putting off for a while and occassionally dropping in on City's game at Blackburn via some websites that currently inhabit a legally grey area. In order to try and keep up-to-date with what was going on around the division Mossley play in though, I had the misfortune to visit a website that operates in a completely different area altogether. One of shoddy amateurism with the faint aroma of stale urine. On second thoughts scrap the latter description because the pee has already been taken with the official Unibond League website. After over twelve months into the job as the league's web partners, Sponsor-Link (an e-business company who don't appear to have their own website) still can't provide a site that is fit for purpose. Ignoring the clumsy navigation, videos that start playing as soon as you land on the site and a list of other annoyances to long to go into, there were no match updates (even though people were texting in the scores to them), the First Division South's results still weren't on the site a full two hours after the games had finished, even though league table was relaying news of a 19-16 scoreline at Grantham, a 9-5 result at Chasetown and a 13-4 triumph for Lancaster over Prescot. I would take the trouble to complain but I already know that the reply would put the problem down to 'teething trouble' despite, as I said earlier, the whole thing having been 'teething' for most of this year. If you don't believe me check this thread on nonleaguezone. Of course the Unibond League have to take their share of the blame too. It's up to them to ensure that the website is fit for purpose and on this past weekend's evidence it isn't. Actually I should have said the Northern Premier League because if anybody from the sponsors parent company Henkel saw the abomination their name is attached too they'd probably go ballistic. I mean, if you manufacture adhesives would you want your name plastered over something that never gets fixed? What makes the whole thing laughable is that last season I, and a lot of other supporters in the three divisions, were told in no uncertain terms to stop posting footage from matches on YouTube because they may not be, and I'm quoting directly here, "of a quality that will reflect positively on the competition and our sponsors." Yet here we are in the latter stages of 2009 and the league seem to be quite happy with a web site that not only makes them look incredibly amateurish, but probably does more to hurt the credibility of their product than a brief clip of a great goal scored at, say, Bamber Bridge ever will. So while it may be a new season and a fresh beginning for clubs and supporters, it appears it's same as it ever was at Comedy HQ. I mean, if it's broke - why bother to fix it? Seriously, there's nothing here about Mossley's first game of the season and their first ever win at Garforth Town. If you want to know what happened at Ego Towers, other than Danny Dignan (not Jordan Goodeve as the latest instalment of inaccurate reporting from East Leeds in the Non-League Paper will have you believe) scoring what turned out to be the winner after 18 minutes and Peter Collinge saving a last minute penatly, then I suggest heading over to Mossleyweb where a report will undoubtedly appear soon. 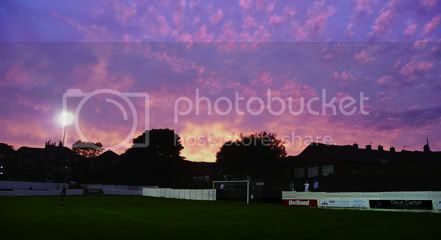 And while I'm recommending other places to visit, it's also worth checking out Simon Howard's Flickr page too for photographs from the match. Normal service on the blog (including updates tweeted live from the match) should be resumed on Tuesday for the visit of Colwyn Bay. Hopefully anyway. After seven warm-up fixtures (eight if you choose to include the kick-around at Dukinfield Town) it's time for the real stuff to begin. Forty two plus games where there's something riding on almost every result. Over 63 hours of potentially nerve destroying football in which heroes will rise and fall, joy will battle it out with misery for our emotions and everybody is always the mythical 'one game' away from something - be it a big cup tie, a play-off spot or even administration. Unlike the proverbial box of chocolates which actually comes with a sheet detailing what each piece of confectionery is, you really don't know what you're going to get to next in football. The question that's bothering me though is this. Despite all of the above, why do I feel so enormously uninterested about the new season? Seriously, this isn't a 'look at me, look at me' Julie Birchill-esque attention seeking claim - I really cannot call up a single ounce of excitement for what may be about to come. To all intents and purposes, it might as well be an unending list of friendly matches stretching out before us for all the enthusiasm I can muster. Nine months of matches for which the only feelings I can generate are similar to those reserved for end of season matches between two sides abandoned in mid-table obscurity - neither of whom I support. If I could represent my feelings with a visual image it would be a shrug. Regular readers of the blog (you merry few) will know that my fervour for football has been, let's say, 'damp' over the course of the friendlies. Although to be truthful that is usually the case with me for pre-season games but the encroaching dawn of a new season usually sees the bounce in me return. This time however things are different. No excitement, no nothing. It's weird because even though our final game of last season was a defeat, I left the Manchester Premier Cup Final at Boundary Park on a high. 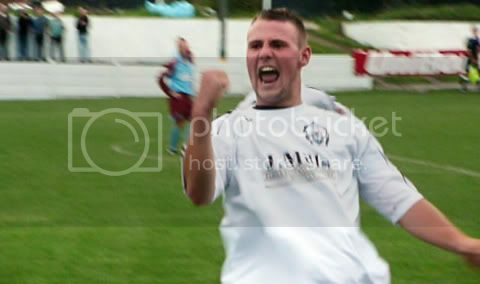 The defeat meant nothing, I was simply proud to be a Mossley supporter. A little over three months later and it's all change. It could be that it's football as a whole I'm falling out of love with. Match of the Day is no longer a must watch and I barely tune in to see live games on the television any more. International matches, Champions League games, FA Cup ties... I can't remember the last time I actually sat down with the intention of watching any of them. May be it's this that's largely affecting the enjoyment I've had watching my home town team for over twenty years. What I do know for a fact is that the events at Seel Park early this summer are partly to blame for my indifference. I don't really want to re-open what are still relatively fresh wounds but I reached a stage of total ambivalence. I know, I'm "not a true fan" (and frankly that nonsense is another contributory reason for my apathy) for thinking such a thing but a third consecutive summer comprising of rumour, uncertainty and being made to feel like a mushroom was one off-season too many for me. It dawned on me that there are other more important things in life for me to worry about (money, a job that could soon be an ex-job) than the continuing trials and tribulations of Mossley AFC, and I realised that I'd probably be better off focusing on them instead. I'm not diminishing the actions of others here, far from it. Kudos to those who stood up and were counted when the crunch came and rallied to keep the club alive. Being the member of the committee, a steward on match days or someone who puts up the netting isn't for me but I have enormous respect for those who choose to do it. Why have I told you all this? I've no idea really. I was kind of hoping that it would help explain why I haven't been posting ten to the dozen as usual on the forum. Why some of the forthcoming match reports may be a little more downbeat than usual or why there might not be quite so many reports from away games this year - even the neutral ones I normally see when I can't get to see Mossley. However I think it has been more of a cathartic experience for me than anything else; the chance to get something off my chest that's been bothering me for a while. Who knows? Now my thoughts are out in the open, like love or a demand from HMR&C for unpaid taxes, maybe the excitement of a new season will arrive suddenly and unexpectedly. If it's going to I wish it would hurry up and do so or else the next nine months could feel like nine years. In your opinion, what was the most controversial incident in football over the past seven days? Was it Michael Ballack's block on Patrice Evra in the Charity Community Shield? Could it have been Evra's ridiculous 'Oh my face' reaction to the blow to the chest he received in the aforementioned challenge and the subsequent miraculous recovery he under went when it came time to complain to the referee? Or how about one of the other contentious decisions that are bound to have happened on a weekend when nearly every league in the country began their new season? Well according to the good people at The Referee Forum, it was none of the above. In fact it was something far more closer to home as you can read for yourselves here (Post 189 to 219). I'm going to ignore the original posters comments about the time taken to get the video uploaded and hoo-ha about Mossley's penalty, but I would like to clear one thing up. Jordan Goodeve wasn't offside when he scored the fifth goal. However the player providing the cross was offside when he received the ball. So blindingly and embarrassingly offside in fact that I actually stopped recording in expectation of the flag and the people I was standing with all said 'offside' in unison the moment it happened - and they were Mossley supporters! Still, it's football and it wouldn't be the same if we couldn't argue about extremely trivial things in games of no importance whatsoever. Er... yeah, we lost apparently. Three goals to one. Three for Kidsgrove Athletic and one for Mossley. The Grove easing past the Lilywhites by a relatively comfortable margin. A two goal cushion. This was Mossley's last friendly before the start of the season. One they'll begin at Garforth Town who play in blue shorts. Which coincidentally is also the colour of Kidsgrove's shirt. Hmm... blue. The sky is blue too due to what's called Rayleigh scattering. The atmosphere absorbs blue light then diffuses it... It's rather interesting really. Did you notice that the last paragraph had four consecutive words that rhymed? No? Okay. Is it anyway noticeable that I didn't go to this match? For the record however, and so that there's not a Kidsgrove-Mossley shaped on the blog, the visitors goal was scored by Mattie Kay scored the penalty spot. It's probably also worth mentioning that Lilywhites keeper Peter Collinge went off injured and his replacement, defender/midfielder Ben Richardson, saved two penalties. I wish I could add more but that's all the information there is about the match that's in the public domain, at least from a Mossley perspective. As is becoming the norm, despite what seems like a sizeable number of Mossley supporters having made the trip down to Staffordshire, very few actually want to talk about it on the forum. Therefore if you didn't go you're pretty much in the dark, not that what happened matters a great deal anyway. The pre-season campaign at Seel Park came to an end last Thursday night in a nine goal... I don't know, what's the opposite of thriller? Apologies for the late appearance of this report but its been a struggle to write - something which doesn't exactly bode well for a match reporter with the season less than a week away. Why such a struggle? Well, despite the continual running back to the centre circle to restart the game, the whole thing was a tad mundane with little to get excited about. As I've said many times in the past, a hatful of goals doesn't necessarily mean a great game and this was a perfect example. There was the occasional bit of good football but there was a fair amount of bad stuff too (and some of the latter will have undoubtedly made both managers rather angry). Despite Springhead (and you don't know how many times I've typed Springfield instead) taking a very early lead thanks to Mossley's propensity for gifting opponents goals (this time a poor defensive back header was the catalyst), a shock result was never likely to happen. At least the sunset was nice though. And that's it from me as far as the pre-season games go. I didn't make the trip to the final friendly fixture at Kidsgrove because... well, I could make up a story of woe that prevented me from going but the truth is I just couldn't be bothered. I know, call myself a supporter? Be it a finger of Kit-Kat that's all chocolate and no biscuit or snooker coverage finishing earlier than planned on television, thereby allowing a decent programme to fill the schedule, it's always nice to be surprised. And there was no bigger surprise than the one which greeted unwary visitors to Glossop's Surrey Street ground last night. The odd lick of grey paint aside it's still the exactly the same as it was when Mossley last visited in 2004(and when I last visited in December). There is however one big difference. Gone is Britain's largest, grass flecked mudflat that used to be passed off as a football pitch and in its place is a lush green carpet. Admittedly it's a carpet that looks as though as it has been laid over some medium sized sleeping animals in a couple of places, but the transformation from what it used to be to what it is now is simply extraordinary - it's now almost a perfect playing surface. No Photoshop trickery here - that actually is Glossop's pitch. Congratulations to the groundsman for doing something that ought to make solving world hunger and ending all wars seem like a piece of pee in comparison. So to the match, and what a good match it was too. The Glossop side of the late Noughties are far removed from the Glossop side that many of you will be familiar with from our time in the NWCFL. The modern day Blues are a good footballing side, and with Mossley keen to let the ball do most of the work too, it made for an entertaining game. And frankly one you wish all friendly matches (and even competitive games) were like. That said, despite the teams being closely matched in some areas there was a near gulf in difference between the two in one very important part - the attack. While the home sides forwards struggled to get anything out of a very well marshalled Mossley back line (and grew increasingly more petulant as the game wore on), the Lilywhites went close time and again to finding the back of the net. The fact they weren't a couple of goals to the good at the break was down mainly to a couple of goal line clearances and some very good saves by their goal keeper. The Derbyshire sides luck ran out though in the second half just after they'd, as it always tend to happen, had their best spell of the game. A block tackle on the edge of the six yard box by Kieran Fletcher set in motion a sweeping Mossley move which, eight passes later, Sam Walker finished by calmly placing the ball under the keeper. If it was a league or a cup match people would have been raving about the goal for a considerable length of time, but because it's pre-season it will be largely forgotten which is a shame. However, thanks to You Tube, it shall remain viewable for the ages. Or at the very least until Google shuts down the servers on the financial black hole the video hosting site currently is. From this point on the result never looked in doubt, despite the lack of any kind of cushion to the score line. A second goal finally arrived in the last minute courtesy of a superb finish by Nathan Neequaye and that was that - the season had moved another ninety minutes closer and Mossley had another victory under their belts at the expense of North End's pre-season 100% record. The one sour note of the night was the behaviour of the Glossop captain who became the first person I've seen for a long time to actually be booked in a non-league friendly. Of course the referee could have asked the home team management to remove him from the game and spare him a yellow card, but the fact is they should have had sense to sub him once the official had spoken to him for the third time about his conduct. Even the Glossop fans stood next to me were shouting for their manager to take him off as he continually talked himself into trouble. Friendly or not, there are some things so you can't say to an official and because of this he starts the coming campaign one card closer to an automatic suspension than every other player in the league. But that was the only downer on what was other wise a very good night. Both sides had a good run out and will be all the better for it. As a Mossley fan there was a lot to be cheered about ahead of the coming match at Garforth. And should Glossop manage to find a couple of people to spearhead their attack, I look forward to them joining the Unibond League next year and leaving New Mills to face another season of NWCFL football in 2010/11.